"Comprehensive and Innovative Advice for Texting and Phoning Women"
Highly effective. Very comprehensive. Probably as easy to implement as it gets - lots of examples, lots of easy rules to follow, clear and simple system to apply. Virtually nothing to say. It's not great value for money if you are already good with texting and phone game. Love Systems could do some things to 'perfect' this product. That's it. Pretty much everyone, no matter who you are will get a lot of value from this product. I would be very surprised if it didn't improve your results in some way. Beginners and even intermediates will get a whole system to follow, while guys of an advanced level will find new things to try out and apply to what they are already doing to take it to new levels. This is a great product, and has been out for a long time. If you want something newer that we have rated slightly higher, check out How2TxtHer by Christian Hudson. This is the first comprehensive product to come out on what you do between meeting a girl and getting her phone number and meeting her the second time (going on a date). Also known as 'time bridging'. It fills a much needed void in the dating advice market. One of the biggest issues for guys once they learn dating advice is that they can get phone numbers but don't seem to be able to meet the girls afterwards to take the relationship further. It's a huge source of frustration, so a book like this has been a long time coming. To bring out a good product on the subject isn't easy because for one thing there is so much uncertainty involved. When you're texting or phoning a girl you really don't know what is going on in her life at that moment and as a consequence there are a lot of unknowns to deal with. In short - this product was going to have to really do a good job for it to be good. 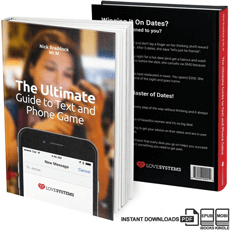 I'm betting that for the vast majority of guys "The Ultimate Guide to Text and Phone Game" will cover a lot of material that you hadn't thought of. It includes virtually everything I've ever come across with respect to using texts and phoning women, and a lot more. It contains a neat system which you can apply to take a lot of the uncertainty out of what you are doing. A big challenge with this subject was to make it easily implementable. Love Systems has outdone itself here by creating some really solid, but simple concepts and drumming them in through out the book. These include areas such as calibration (short, medium and long fuses) and The advice is very well structured. Braddock and Mr. M have written a book that flows with a slow and steady build up of simple concepts reinforced with plenty of practical examples. The care taken in making it usable by the reader really shows through. This goes down to how they have kept the content simple, with five or so main themes to keep in your head when texting and phoning women. It doesn't get overly complicated which is a typical issue with dating advice. For those who have read Love System's core product the Magic Bullets Handbook, you will also find that the material is supplementary and fits with the rest of their approach to dating. Understanding their 'emotional progression' model and other items properly will undoubtedly reinforce your ability to use this product and apply it effectively, since is built on top of these core concepts. Beyond using many practical examples, this ebook doesn't let up from giving you 'hard rules' to go by. There are many times where I was thinking about how something isn't relevant in all situations - and bang - every time they would put a note or firm rule at the end telling you when not to use it. This is invaluable. It goes as far as giving 'do - do not' lists to make things really easy for you to follow in more complex sections such as 'sexualisation'. There are a lot of subtleties that go into calibration of texting, which could very well take years of experience to understand - it was a long process for me. The ebook has captured many of these - again, really essential if you want to get good at this stuff. This was by far not an easy subject to make clear, and the efforts to do it really come through in the book. This is truly a great product from this point of view and I'm looking forward to hearing how it impacts students results. I'm sure it's going to do well. I'm sure this ebook will destroy quite a few limiting beliefs for guys. A key example is how it is possible to have nothing happen with a girl over a long period of time, a month, or even a year, and despite this, through some good text and phone game, make it work in the end. There are quite a few examples of Braddock and Mr. M going though this 'slow burn' type of game. Caveat: Keep in mind that there are also many girls who will simply disappear in those situations, and that the examples in the book show the positive outcomes to demonstrate what is possible. Many guys give up too early and don't persist enough or in the right way - the book tackles this subject well. These are the few pitfalls or areas to be aware of before you buy and implement - just so that you don't get potentially disillusioned. These are really the only negative things I have to say about the product and only because I'm being critical in an idealistic manner. 1. Phone Game: The book is entitled 'the ultimate text and phone game', however in reality 95% of the content relates to texting. There is good reason for that focus, however I would've liked more time spent on discussing the subtleties of being on the phone with women. There is room to add more detail here to the same level of 'capturing subtleties' as has been done with texting in the book. It is covered well, however, not to the superior level of the rest of the book. 2. Advanced Non-Essential Material Warning: Towards the end of the ebook there is a large section dedicated to 'Sexualization'. It's good material, but for most readers this won't be immediately usable and even 'dangerous' to their results. Braddock and Mr. M give several warnings about this, well done, however I imagine that the emphasis on it will still lead many students to jump on it, especially as it looks exciting. In reality, such content is less important than the rest of the book - only useful for certain dating situations. It was not mentioned in the book but it is actually great for existing relationships (not sure why this wasn't mentioned). If you buy the book don't get overly involved in this section, thinking because it uses up many pages it is an important part to get things working for you. In most situations it really won't make the difference between a bad and good result. In others it will sabotage your efforts. Be mindful of this if you aren't at an advanced level. 3. Make it More Visual: There are no diagrams or visuals in this ebook. It's pure reading. It's a shame, because just a few diagrams could have captured and communicated the message and advice that much more clearly. I hope to see some in future revisions, because that will make it even easier to use. If Love Systems tackles these issues, it would turn this from an Excellent to a truly Outstanding product. When I see an ebook priced at nearly $100, I take a hard look at it to see if it is worth that money. There are only a few premium products in the market which charge this price. This book is relatively narrow, looking at a small area of the overall dating skillset. So at first glance you may ask "Why so much given that it doesn't cover many subjects?". I would say this. If this is an area of your skillset that is not working for you - it will be good value. This isn't an optional add on to meeting women, it is an essential part of the puzzle. And it isn't covered in other products anywhere near as extensively although it may be touched upon. The value is in its ability to change your results. The one caveat: If you are just looking for a few tips to improve something that you already do well, and $100 is a lot of money for you - it most likely won't be worth you buying it. I can only say Get this product if you are either not entirely sure what to do with phone numbers of women once you have them or you are getting phone numbers, and having those numbers 'blur' (i.e. never lead to meet ups)? I know this is the case for many guys. This is an excellent product. It was high time someone tackled this frustration point for guys - Awesome!